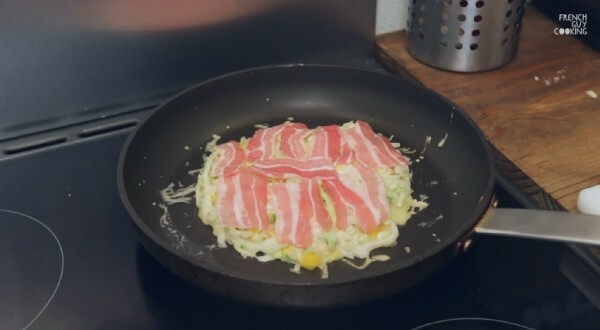 As promised here is my twisted version of the traditional Okonomiyaki recipe: I went American and experimented with the bold and smoky flavours of the Southern barbecue. The batter is the same of the traditional Japanese pancake but for the dashi (or fish stock) that I suggest you to omit. 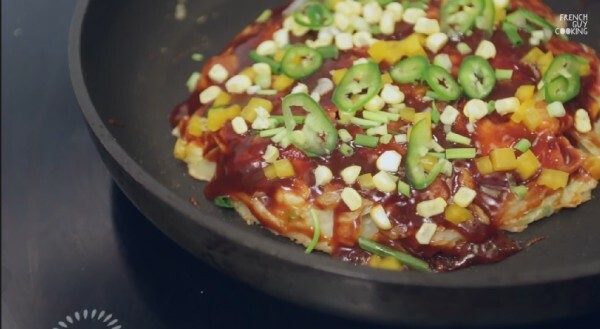 It’s perfect to use any leftovers and this American BBQ style Okonomiyaki will serve you well for a dinner with friends. In a bowl combine one cup of flour with one tablespoon of potatoes starch. Add 3/4 of a cup of water and mix well until you get a silky texture, adding a bit more flour if it is too runny. Complete the basic batter adding a big handful of thinly sliced cabbage, a small handful of chopped onion, two eggs, salt and pepper. 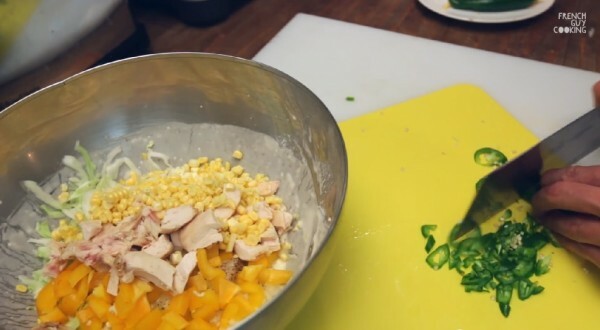 To the base add a handful of roughly chopped roasted chicken, diced bell peppers, sweet corn and the jalapeno (remove the seeds if you don’t want it too hot and spicy). Combine everything gently until everything is well coated in the batter. Pre-heat your skillet or a frying pan over medium-high heat. Lightly oil the surface and pour a big ladle of your batter to get thick and round pancakes. Place bacon strips on top and add a tablespoon of batter to embed them into the pancake. Turn it after four minutes with the help of two spatulas. Cover with a lid and cook four more minutes, then flip it again. 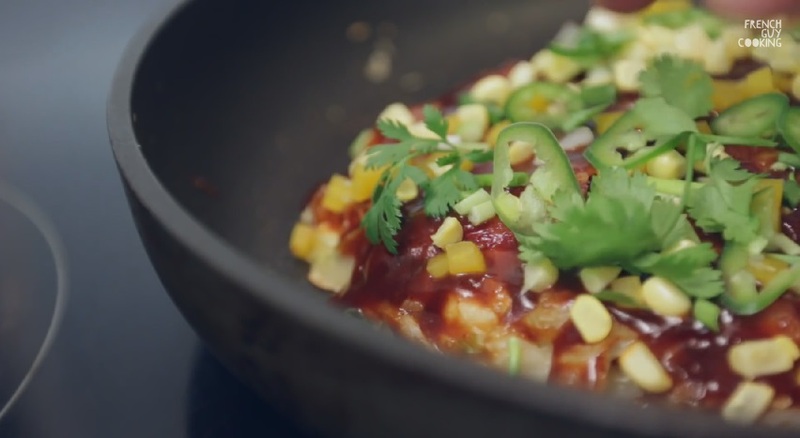 Spread the top of your Okonomiyaki with regular bbq sauce and sprinkle with spring onions, sweet corn, jalapeno and fresh coriander and serve it hot.